Sorry, it's been a while since I've been able to blog much. Been very busy recently, engaging physicians, APRNs/PAs, residents, nurses, pharmacists, and other clinical leaders. Since I had a few free minutes this holiday season, I just wanted to take the time to offer some insights into the links between Computerized Provider Order Entry (CPOE) and order set design and strategy. The doctors are using 'ADCVANDISMAL' or pre-existing paper order sets as the only guidelines for building their new electronic order sets. 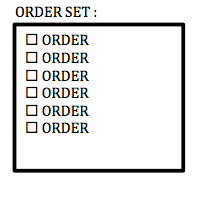 Order sets are quite long, sometimes several (2-3) pages. Providers find themselves spending time searching through these long order sets, looking for the two or three orders they want to place at a particular moment, or using the same order set over-and-over for different clinical scenarios. Providers might have somewhere between 2-4 order sets that they use for all of their ordering needs. There is limited use of headers above sections of orders, to give providers guidance about when to check (or uncheck) an order. There is limited use of pre-checked orders. Providers might complain about 'long order sets', clunky order sets' or 'too many alerts'. Gradually, through trial-and-error, some organizations learn that good order set design takes real work and very detailed planning. So I'd like to offer you a way for you to develop what I call a "well-indexed order set catalog strategy", before you begin your CPOE journey. Before we begin, let me warn you that there may be other strategies that may work better for your organization. The strategy described below may work, but it may not be ideal for your organization - especially if you already have a starkly different strategy, in which case there may be a serious learning curve for your providers. Read on, and judge for yourself - But always make sure you check with your local informatics professionals before designing an order set strategy for your organization. 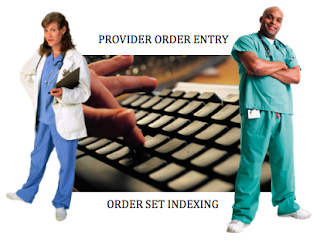 "Order set (n.) - a collection of orders used to standardize and expedite the ordering process for a common clinical scenario." Take a good look at the above definition. Does it work for you? Simple and effective, but before we move on, make sure it looks good for you. If you think that's fairly reasonable, then let's build an index on this definition. If the concept of "order set" is linked, by this definition, to the concept of "common clinical scenario", then what exactly are common clinical scenarios? Shorter, faster order sets which can often be pre-clicked (in many scenarios, depending on your local policies), and pre-built with better decision support to better guide providers to better choices. Fewer duplicate-order, duplicate-therapy, and drug-drug interaction alerts = Less alert fatigue. Better ability to share order sets among specialties - Why should the workup for chest pain be different in the ED than on the floor? If one provider builds an order set, shouldn't everyone benefit? Faster build time and easier maintenance - Need to make sure all admissions to med/surg have a code status order? Only one order set needs fixing, not twenty. And the disadvantages of this strategy? Your providers will use more order sets, and so having them go through the catalog to select their favorites and use them may take a few more clicks than if they just have 2-3 order sets that they use for everything. But you can always build synonyms that help speed up the alpha-search for these order sets, and I do believe that the many benefits outweigh this small disadvantage. Of course, if this is a significant deviation from your current strategy, you will want to engage your local leadership to review this strategy, think about the cost of re-training your docs, and going forward with such a new strategy. And if you already have such a strategy - Congrats! In closing - I hope this has been an interesting discussion on order set indexing, and how it impacts the naming convention, speed of ordering, ability to custom-design decision support, physician/provider experience with CPOE, and ultimately, the ability to continuously encourage physicians to deliver better, evidence-based, updated best practices. Thanks for taking the time to read this, and I hope everyone is looking forward to 2017 and what it will bring the #HealthIT and #Informatics communities! This post is for discussion and educational purposes only - Always consult your local informatics professionals before deciding to adopt an order set strategy. Have any thoughts, comments or feedback? Or want to share your own order set indexing strategy? Feel free to leave them in the comments section below!